The CRC campus has officially migrated to Lync! This means that the Lync migration project for this campus is now wrapped up. We have successfully migrated 491 Microsoft Lync objects at this campus alone (includes users, common area phones and auto attendants). This migration involved a lot of time, effort and coordination. Congratulations to everyone on a job well done! This entry was posted in News on May 22, 2015 by Mike Muzinich. With the start of the new year we have a start to a new project! The fax machine is a technology that needs to be retired yet it has managed to stick around. Our solution to phasing out the fax machine is to implement a fax solution that utilizes our existing technology, email. With the new fax system, you will send and receive fax via your Losrios email. It’s as simple as emailing an attached document. As with our previous projects, we will be starting with a pilot. If you’re interested, please submit your fax information to the Fax Inventory page. For 2015 lets commit to no more paper jams, ‘out of toner’ messages, or busy signals! This entry was posted in News on January 2, 2015 by Mike Muzinich. 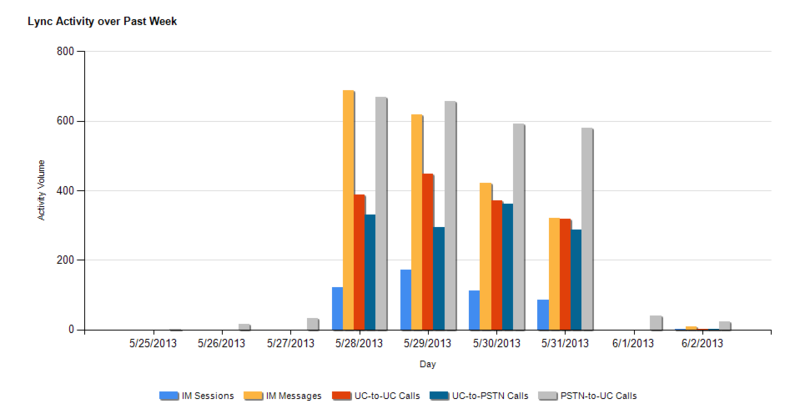 The summer semester is closing in and our Lync deployments are moving even faster. If you’re not sure when your department is migrating to Lync (if you have not been migrated) please check the Lync Migration Schedule. This entry was posted in News on April 21, 2014 by Mike Muzinich. As the new year just began, we are looking at a strong start for 2014 in the Lync world. We have commitments leading into September from departments looking to migrate to Lync. To best serve you, we’ve put together a deployment schedule which consists of scheduling Lync migrations on Tuesdays and Thursdays starting at 9am. This allows us to fine tune things in between roll-outs as necessary. Check out our latest deployment schedule here. This entry was posted in News on January 27, 2014 by Mike Muzinich. The purpose of this document is to provide an update of the Lync project. Sponsors, Project Leads, User Group members and related parties will receive a copy. We appreciate all the hard work and cooperation of everyone who has come into contact with Lync. Significant progress has been made on the Lync project. As we have been successful in making our way through the initial phases of the project deployment, college teams have hit their stride. 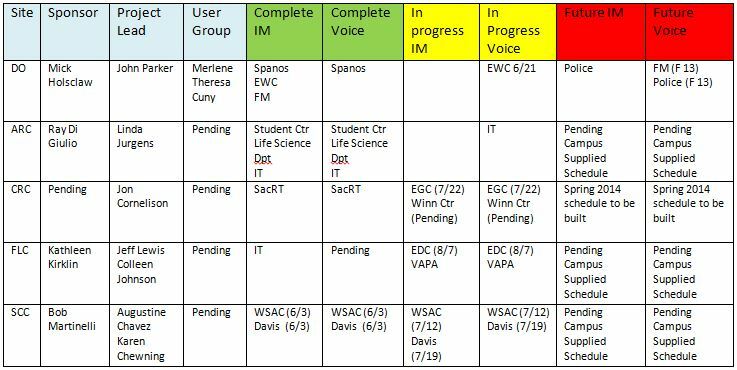 DO and college teams have projected Lync project end dates. Each college is using a slightly different methodology; however, each methodology is working well for their college. All centers, colleges and site locations throughout Los Rios have Lync deployed except for FM. Every location except for a main college campus has all users converted to Lync. The infrastructure deployed was a significant technical challenge addressed by Mark Williams and Vitaliy Taryanik over the last 6 months. Lync has been configured successfully with inbound and outbound traffic, failover to alternate locations and call routing. This allows the remainder of the project to concentrate solely on user migration. 18 months ago we migrated all users to Unified Messaging. That migration established we had 2,145 college users of voice services. As we continue to migrate individuals through Lync, we have the ‘IM’ or Instant Messaging Service and the Lync Voice Service. We are gauging success of the Lync User Migration as a percentage of the UM user base. At present 39% of all users are now running IM and 25% are running Voice Services. Congrats to all involved! We had originally targeted the end of December to complete the Code Blue and Alarm migration out of the PBX. However, Joe Kramer, Kathie McCreery and a contractor Mike Hopper have been working at each location to find, locate and document unused analog lines (called measured business lines or mb’s). The survey work has identified significant project and college savings through the repurpose of unused lines. As well, we are improving our documentation considerably in the process. Each site location and college campus has a location in their mdf that terminates all AT&T or Frontier phone lines. As we complete the survey for each location we are placing documentation within the mdf that can be used by college IT staff, DO Technical Services staff and FM staff to understand all lines, their use and how they connect to the site infrastructure. And additionally, this information will be used to reconcile to the phone bill. In November we held an initial Lync User group meeting. It was well attended with good feedback provided to the Lync team. We will meet again in February to discuss online conferencing sessions and faxing. Both options are enhancements the Lync team would like to understand and provide for the continued use of these features in the Lync system. Mike Muzinich has completed the firewall deployment to each site location throughout Los Rios. Firewalls will provide considerable stability and security to all network activity in and out of a location. Tim Smith has worked with ARC, FLC and SCC to determine all switch needs for the Lync project. In the first four months of 2014 collectively all three colleges will be deploying 61 telecommunication closets with new switch equipment to support Lync. All three colleges used this opportunity to review their current infrastructure and will be purchasing additional switch capacity. The new Lync required switches have in some cases replaced existing switches that are being moved to new locations across campus to improve the age and stability of the network. As part of the Lync project, as we evaluate new switch needs we are also evaluating new UPS needs. We have found a few times over the last few months that location outages were mitigated by UPS’s that were able to keep equipment running during the outage. In the past, with our older UPS’s we were not able to do so. The Lync project has provided equipment that has supported considerable, improved outage uptime. This entry was posted in News on December 12, 2013 by Mike Muzinich. Most of the centers have been migrated successfully to Lync. This summer we migrated Davis, West Sacramento, El Dorado and Ethan Way. We successfully opened the Elk Grove Center with Lync. We will migrate Natomas on October 30th and Public Safety Center on November 7th. Once Facilities migrates to Lync, all Los Rios locations will be running Lync. 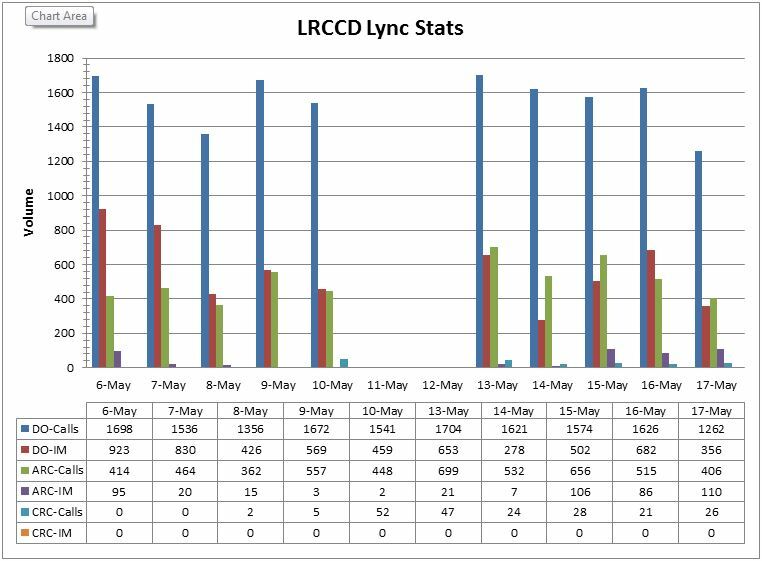 We currently expect to convert roughly 2,800 users to Lync over the life of the project. To date we project we have migrated 650 or 23% of the Los Rios population. By the first of the year we project we will have 30% converted to Lync. We have made significant progress with the much appreciated help of our college IT and operations staff. ARC: Converted 75 users including the bookstore, the Presidents Office. ARC expects to continue rolling 10-15 users every other day. ARC is projecting they will have roughly 200 users converted in academic areas by December including Counseling, Enrollment Services, McClellan and Natomas. FLC: Has converted EDC and the IT staff. We are looking to convert a mixture of 85 academic and administrative staff and the bookstore by January. SCC: Converted 175 users in October to Lync in various academic departments and the bookstore. SCC expects to begin a new wave of users in February and then again in summer 2014. With the significant momentum at ARC and SCC towards their Lync implementation, college staffs have been handling the Lync training to much success. We applaud all the materials produced in collaboration with the DO to meet their specific campus needs, as well as the investment the colleges have made to help their college Lync implementation be such a success. Lync IM continues to be a very successful communication tool in many areas. If you are in the Lync client and type an individual’s name and can locate them, they are Lync enabled. We suggest you reach out to one new contact a day via IM! In order to ensure the Lync Unified Messaging (voice mail), Instant Messaging (IM) and Voice services and the upcoming video conferencing and fax services meet and exceed our users expectations we have formed a Lync User Group. The Lync User group is comprised of end users who can best inform how the Lync system can meet their needs. There is no minimum or maximum a college can send. Each member is responsible for representing their area. Each year DO-IT purchases new servers for use in the VMWare environment. This year, the servers refreshed in the VMWare environment will be deployed to center sites as primary firewalls and to some colleges as secondary firewalls. By January, each Los Rios location will have a fully functioning firewall that will enhance the reliability and support of local services in the event there is an internet (fiber) disruption of service. Natomas, Public Safety and Facilities Management will be receiving new firewalls by the first of the year. Outside the ability to support reliability of local services such as access to file shares, printing and Lync phone survivability, these new firewalls will provide the infrastructure to support the PCI network for credit processing, Facilities Control network management and public wireless. The introduction of the firewalls is a significant improvement in overall services and reliability offered by DO-IT and a direct result of the Lync project. For the deployment of Lync, we have purchased close to 25 switches for all campus locations where we could not leverage existing switches. In addition to considerable benefit to the Lync project to have PoE switches, each college is able to repurpose some current switches to locations with aged, out of support switches. This will lead to considerable improvement in stability of the network as well as a good foundation for the wireless network as well. We have been replacing aged, 11 year old UPS’s or providing new UPS’s in many locations. Primarily we have deployed new UPS’s to the core infrastructure at CRC, EDC and SCC where the campus will now have at least an hour of uptime as opposed to 15 minutes prior to the Lync project. We experienced outages this summer at each location that had these UPS’s been deployed, uptime would have been much improved. The UPS replacement as part of the Lync project is providing significant improvement to the overall reliability of our infrastructure. As part of the migration from the NEC PBX system, and to support significant improvement to the overall reliability of the infrastructure, we will be moving the code blue and alarm lines to AT&T or Frontier. By having these key security lines individually supported by direct phone lines called 1mb or measured business lines similar to a phone line to your house, these key systems will operate independent of any Los Rios infrastructure issues. The analog lines will be deployed through the coming months with the migration anticipated by the end of December. As a reminder, we are moving through a process to reclaim T1 lines that should have been removed with the migration of campus services to fiber. Once we complete this project, we will begin to move to SIP trunking lines for the redundancy of the voice network. T1’s are a very costly and older technology to SIP trunking. SIP trunking will allow us to leverage our fiber network investment as well. This entry was posted in News and tagged lync update, migration on October 28, 2013 by Mike Muzinich. The purpose of this document is to provide an update of the Lync project bi-weekly. Sponsors, Project Leads, User Group members and related parties will receive a copy. We appreciate all the hard work and cooperation of everyone who has come into contact with Lync. Use of IM continues to skyrocket in use at the DO and ARC. We are evaluating different vendors for battery continuity of service in the event of a power outage. We have a draft UPS replacement schedule built by college Telecom Closet (TC) location. A preliminary draft UPS classification for expected service level was sent to the college IT Supervisors this weekend. Discussions will continue through June 14th. There are almost 350 UPS’s maintained through central funding for all college locations. Colleges may also benefit for their separate UPS refresh needs. The purpose of this section is to describe the status of the various areas with respect to Lync. 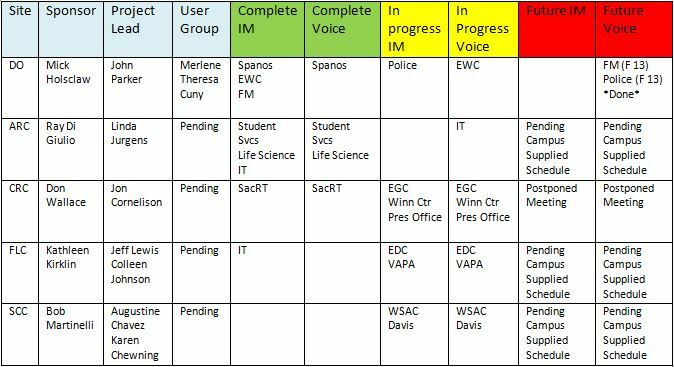 The purpose of this section is to depict the various Lync activity so that we can see the progress. This entry was posted in News on June 3, 2013 by Mike Muzinich. EWC, WSAC, Davis, VAPA, CRC Presidents Office and El Dorado are slated for this summer. We recommend a deployment of the Lync client for IM as soon as possible for each location. The DO has released Lync everywhere except for Police which is pending. This entry was posted in News on May 28, 2013 by Mike Muzinich. Phase I of the Lync roll-out is now complete at the District Office! The first phase of the roll-out consisted of 131 users who had the Lync client installed on their workstation. On the first day, we had 91 of these users run and activate the Lync client and 266 Lync Instant Messages sent on our first day. This entry was posted in News on March 12, 2013 by Mike Muzinich. ARC’s first Microsoft Lync deployment is in the new Student Center and Science/Fine Arts buildings. Lync is now actively in use at the Center for Leadership & Development, Journey Counseling, Student Development, Campus Life, Community & Diversity Center, Business Services and eServices! This entry was posted in News on February 8, 2013 by Mike Muzinich. As of November 2012, the Unified Messaging migration has been successfully completed. 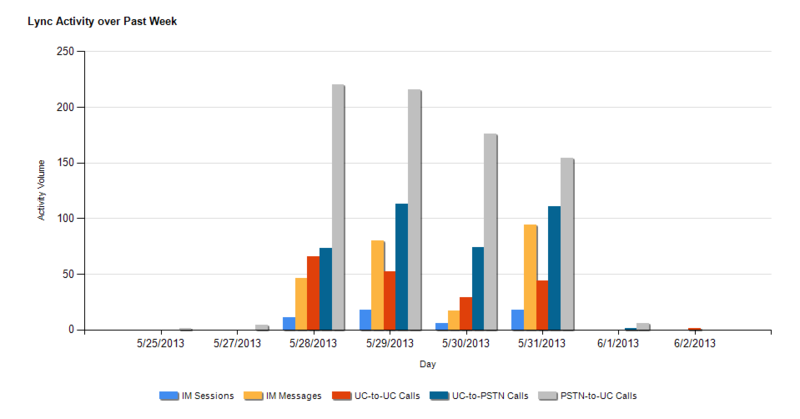 Over 2,500 users are now actively using UM as their primary voice mail system! The above statistics include all calls that were received by our unified messaging voice mail servers which includes inbound calls to individual voice mail accounts, auto attendants, missed calls (people hearing your greeting but decided not to leave a voice mail). This entry was posted in News on January 31, 2013 by Mike Muzinich.